Photoshop can determine the shutter count of a camera. Load a RAW file and follow the steps below. xxxx is the number of shutter actuations your camera has made so far. I don't usually look at these numbers. I only look at them when selling or buying (used) camera bodies. In general, the lower the number, the lesser the usage. This is one of the factors that influences the value of a camera when you're selling. There are freewares that determine the shutter count or shutter actuations. 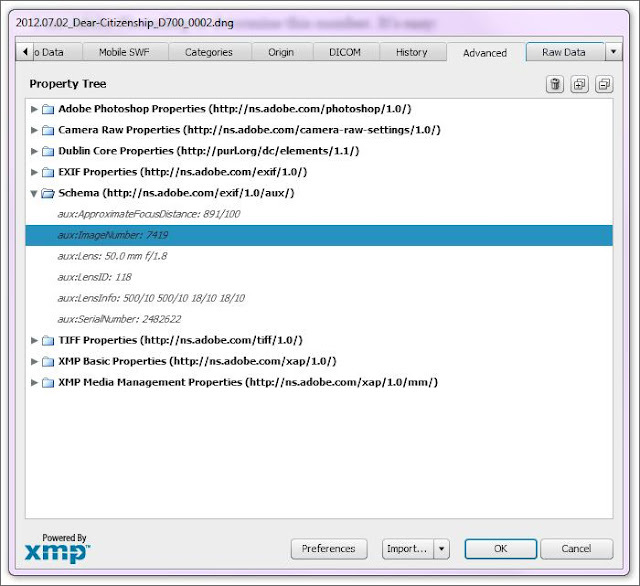 Some popular softwares are Opanda EXIF reader and IrfanView. For Irfanview, you still need to install a plugin for it to work, but it's fairly easy to do. The plugin is also downloadable in Irfanview plugin section of their website. Both software can also read EXIF data, so you're going to see more information besides shutter count. If you don't have Photoshop and still wants to know how many clicks your camera has made, there are dedicated website that helps. I've found this website, Camera Shutter Count, that lets you upload a photo and determines the shutter count from that photo.